One Direction: Straight to the Top - Profiles, Quizzes and Stickers! Five boys. One unstoppable pop music sensation… and one massive must-buy for devoted fans! Get the lowdown on the super-cute boys from the band, from their humble beginnings to worldwide adoration. Then quiz yourself to check how well you know 1D! 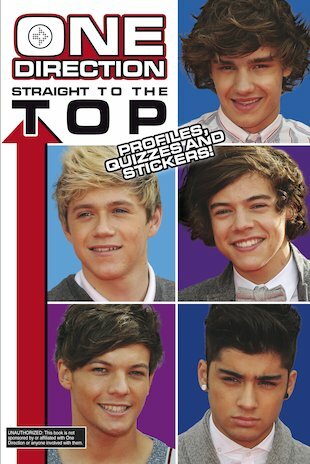 As well as spoiling you silly with gorgeous colour pics and stickers of the boys, this book is packed with personal profiles and fun facts about how Harry, Louis, Liam, Niall and Zayn made it to the top. Follow the talented boys as they go from TV show contestants to global superstars, riding high on the X-factor that makes them stand out from the rest! THIS BOOK IS GREAT AND I MEAN IT IM THE BIGGEST AND BESTEST FAN OF 1D IF YOURE A FAN THEN GET ONE!